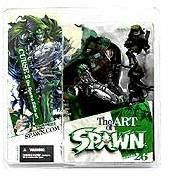 Description Of Item: Spawn Series 26 - The Art of Spawn - The Curse 2. This Figure is from the Spawn Bible series. The Curse is a fiend from Spawn's many enemies. With this figure, the very tiny details from his weapon, his cape, and to his little minion are outlined. This is maybe one of the most detailed Spawn figure yet.